Our pastoral care ministry is led by professional chaplains who are linguistically, culturally, ethnically diverse from various Christian religious traditions. We are grateful for the hundreds of volunteer ministers from congregations, the Ministers of Care, Spiritual Welcome Volunteers, and musicians. We are able to extend spiritual care to our Muslim patients with the help of Muslim Spiritual Welcome Volunteers from the local mosques. Our recently established therapeutic music program which is solely funded by philanthropic support extends healing music to our patents. We continue to serve the health and wellness needs of congregations with seminars, symposiums, educational events, health education, and health screenings by from congregations and from the hospitals throughout the year. By the grace of God, for the past 23 years, Advocate Health Care has been meeting the health needs of our community. Founded on the faith based and values driven histories of two of the finest health care ministries, the Evangelical Health System Corporation of the United Church of Christ and the Lutheran General Health System of the Evangelical Lutheran Church in America, Advocate Health Care was formed in January 1995. A time to look back. A time to look at where we started. Founded in 1897 by Norwegians who had settled on the Northwest side of Chicago, Lutheran General Health System originally was known as the Norwegian Lutheran Deaconess Home and Hospital. It carried on a broad community program of social work and care for court-adjudicated youths, as well as operating a hospital and a training school for nurses and deaconesses. In 1904, the organization came under the control of the Norwegian Lutheran Church in America, which later evolved into the current, Evangelical Lutheran Church in America (ELCA). Founded in 1906, Evangelical Health Systems Corporation originally was formed by the Evangelical Synod of North America to operate the German Evangelical Deaconess Hospital in Chicago. In 1934, the Evangelical Synod and the Reformed Church in the United States merged to form the Evangelical and Reformed Church. This union nurtured the further development of the organization. Then a merger in 1957 between the Evangelical and Reformed Church and the Congregational Christian Churches formed the United Church of Christ (UCC), and Evangelical Health System became a UCC affiliate. Since its inception in 1995, the mission of Advocate Health Care remains unchanged, “The mission of Advocate Health Care is to serve the health needs of individuals, families, and communities through a wholistic philosophy rooted in our fundamental understanding of human beings as created in the image of God.” To guide its actions, Advocate stresses the values of compassion, equality, excellence, partnership, and stewardship. Have you noticed, our mission statement clearly states our intent to serve the health needs of not only individuals, but also communities? In response, we work in partnership with the faith community. This partnership, the Congregational Outreach Ministry is focused on (1) effective communication, (2) health education, (3) health and wellness leadership development, and (4) building wellness centered faith communities. A time to look to the future. A time to look at where we are led by God. Thanks to the Clinical Pastoral Education (CPE) program at Advocate Good Shepherd Hospital, Advocate Condell Medical Center, and Advocate Sherman Hospital, we are able to offer intensive and extended 400 hours of internship training and yearlong, full time, paid residency programs at these hospitals in Lake, Kane, or McHenry counties. In addition, we offer multi-year, paid CPE Supervisory training at Advocate Condell Medical Center. 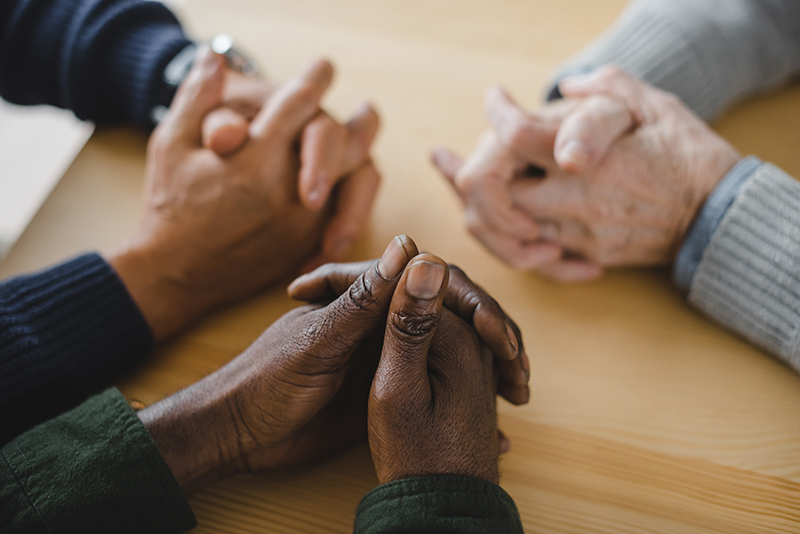 Our pastoral care ministry is led by professional chaplains who are linguistically, culturally, ethnically diverse from various Christian religious traditions. We are grateful for the hundreds of volunteer ministers from congregations, the Ministers of Care, Spiritual Welcome Volunteers, and musicians. We are able to extend spiritual care to our Muslim patients with the help of Muslim Spiritual Welcome Volunteers from the local mosques. Our recently established therapeutic music program which is solely funded by philanthropic support extends healing music to our patents. We continue to serve the health and wellness needs of congregations with seminars, symposiums, educational events, health education, and health screenings by from congregations and from the hospitals throughout the year. Keep us in your prayers as we seek to serve the health needs of the community!